Eilan and his cousin have met before, but they're just now old enough to appreciate one another. 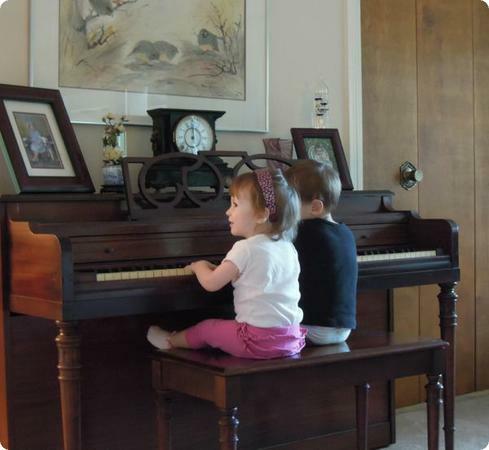 Here they are, playing a noisy duet on my own childhood piano. Sophie on November 24, 2011 at 2:28 p.m.
Lisa on November 24, 2011 at 7:21 p.m.
What a precious photo! We live far from family as well and holidays are treasured times for the cousins to get together. Have a wonderful Thanksgiving with your family! Debbie on December 2, 2011 at 10:24 p.m. I only just now noticed Eilan's diaper peeking out of the back of his pants. Somehow that makes it even more adorable.